WWE refused to have the WWE Championship change hands at Elimination Chamber 2019. As we all saw earlier, Daniel Bryan overcame all the odds to retain his WWE Championship inside the Elimination Chamber in a clean fashion. He came up against strong challenges from Randy Orton, Samoa Joe, Jeff Hardy, AJ Styles, and especially Kofi Kingston. It is quite unusual for a heel champion to retain the championship inside the Chamber in a clean fashion. Bryan was the Iron Man of the match, but Kingston stole the show. Fans wanted Kofi to win, but ultimately, he could not kick out of the second running knee from Bryan. 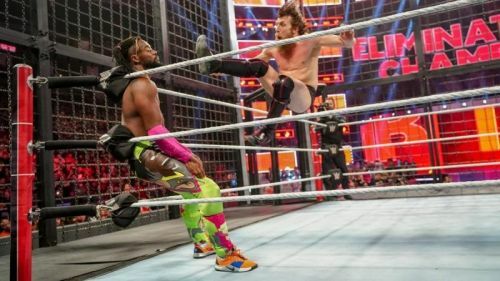 Even though Bryan played the role of a cowardly heel, he stepped up in the final part of the match and delivered a brilliant 12-minute-bout with Kofi Kingston. However, after the match, most WWE fans were divided in the opinion that Daniel Bryan should not have retained the championship. But we feel it was indeed the right move. In this thread, we will take a look at four reasons why it was the right move to have Daniel Bryan retain the WWE Championship. #4 Daniel Bryan had to look strong before WrestleMania 35. Daniel Bryan had a strong showing at Elimination Chamber 2019. WWE's biggest mismanagement of heel champions comes in the form of booking them as a coward who can't win a match cleanly. With WrestleMania around the corner, it would be absurd to book Bryan as a coward, since it would kill his legitimacy as a champion. Bryan needed help from Eric Rowan at the 2019 edition of Royal Rumble to retain his title against AJ Styles. That did no good to either Styles or Bryan. However, this win gives him more credibility than before - eliminating both Jeff Hardy and Kofi Kingston from the match. Bryan survived five opponents and 36 minutes of hell inside the Elimination Chamber, and even kicked out of a Trouble in Paradise. What if Kofi Kingston wins the Elimination Chamber? Thank You, Kofi: The New Day star shows us why we love pro wrestling! Opinion: Did WWE miss Kofi Kingston's Breakout Moment?